This course involves a variety of topics including a range of sciences, practical food production, design and technology. You can gain additional certificates such as health and safety, food safety, risk assessment and HACCP. This ensures that you will be fully prepared for a wide range of food related careers. On successful completion, you can progress onto a degree or go directly into industry where demand for technically qualified staff grows every year. You can progress on to the Foundation Degree in Food Manufacturing with Business Management or a degree in Food Manufacturing with Business Management. Belle wants to make life sweeter for consumers by developing new chocolate products. She’s had a great start to her career, spending her month’s student placement with Mondelez International, owner of Cadbury. Working in the global section, she joined ‘imagineers’ (new product developers) on a project which in five years may see a new chocolate product on the supermarket shelf. A creative and hands-on person, Belle has enjoyed the balanced approach of our Level 3, which combines practical sessions in our processing plant with theory. She’s also gained HACCP and food hygiene qualifications and enjoyed a trip to Denmark and Sweden to visit Tetra Pak and Arla factories. She completed her course by receiving our ‘outstanding student’ award. 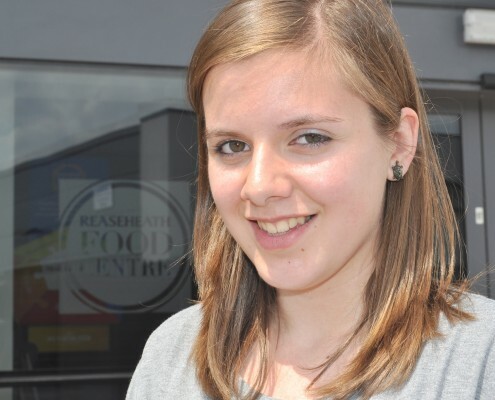 Keen to make the most of the many graduate opportunities offered by the food industry, Belle aims to progress onto our Foundation Degree in Food Manufacturing with Business Management or find a company which will offer her an apprenticeship. She says: “Coming to Reaseheath has really opened my eyes, I never realised the number of opportunities there are out there”.